Hands up if your toddler has ever thrown a screaming fit in the grocery store because you wouldn’t buy gummy bears, or at the park because it was time to go, or at home because you couldn’t find the rainbow socks for her to wear to preschool. All of you? That’s what I thought. Tantrums are a challenging but very normal part of living with a young child. Kids at that age are still learning effective communication skills, which can be enormously frustrating for them. By about three years old they are also developing autonomy, which means that they know what they want and do not appreciate being told they can’t have it, whether it’s a popsicle or an extra TV show. Although it can be tempting to try and control tantrums using traditional discipline such as giving them options or time-outs, it’s important to remember that young children are not in control when they’re having a tantrum. They simply can’t be expected to be reasonable. So what can you do about tantrums? Here are my top three tips. While all tantrums come from a child wanting something he can’t have (to stay at the playground, to have a cookie, to wear his shirt backwards), they tend to occur most when the child is tired or hungry. It’s impossible to prevent every tantrum, and sometimes you will have to stop at the grocery store on your home after your child has had a long day at daycare. But knowing that your child will be more prone to having a tantrum in the store, be prepared and carry a little treat with you for when the tears start to come. Don’t schedule visits with family or friends at times your child usually has a nap, and always make sure you have snacks on hand in case you end up being out longer than you thought you would. Sometimes, ignoring the tantrum is the most effective way of dealing with it. If the tantrum happens at home, let the child scream and cry until she settles down. You can try to offer a hug, but if she won’t let you near her, tell her you understand that she is angry and sad and let her cry it out.If the tantrum happens in public and your child is out of control, remove her from the scene and take her to the car where she can yell without disturbing others. When she calms down you can go back in the store, or if she’s completely had it, you might just have to go home and try again later. If your child is whining and unhappy and you know you are about to have a storm on your hands, distract him with a funny song or story or try to get him engaged in another activity. Show him a book or a toy, or if you’re at the park or a playgroup, bring his attention to something he hasn’t played with yet. Although it can be hard, try to resist getting angry with your child when she’s having a tantrum. If you start yelling too, you’ll just have a lot of noise and frustration without any solution. Yelling will not solve the problem. Remember that the child is not thinking clearly and is not able to snap out of it because you want him to. You just have to ride it out, and before you know it your child will be back to her sunny self. 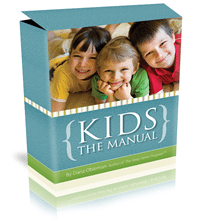 Also, If you’re looking for a complete “action plan” for dealing other with common discipline problems in children aged 2 – 12, click here now to check out Kids: The Manual. It contains comprehensive strategies to eliminate fighting, whining, not listening, rude behavior, and much more!